By February 2017, new listings of new or manufacturer refurbished items in most categories will require at least one of the product identifiers (e.g. UPC, GTIN, one of the above, etc.). Also, note that the options “Does not Apply” and “NA” will no longer be available for the majority of items. Some categories and item types will continue to be exempt. The list of exemptions will be communicated by next year. To simplify the process of listing and relisting, you’ll be able to upload your entire catalog of products by fall 2016. When you provide your product information to eBay through our new catalog-upload feature, we’ll create eBay product identifiers (ePIDs) for you, which help you build your brand on eBay. ePIDs offer sellers of private label and unbranded items access to the benefits and insights branded inventory currently enjoys, including eBay product reviews. Structured data empowers an improved shopping experience for buyers by increasing the ease at which buyers can find items, and delivering the information they need to make a purchase decision. Improved search visibility on and off eBay via eBay Best Match, external search engines such as Google and Bing!, and social networks. Merchandising and deal modules, such as eBay Deals, bargains, and other promotions. 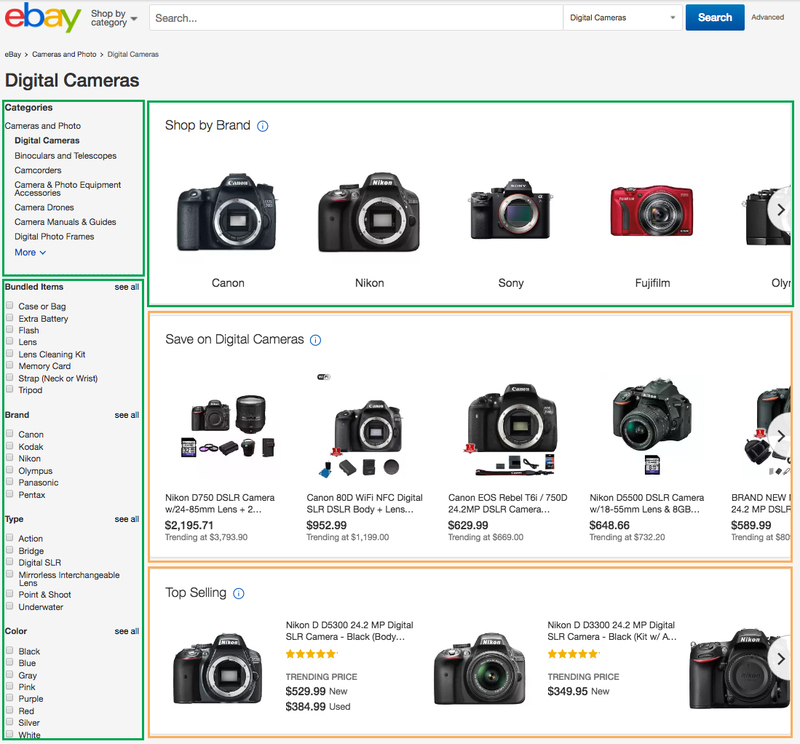 The millions of new browse and product pages we’re building for buyers who enter eBay via social networks and external search channels. Product reviews, which are only enabled for items that include an eBay product identifier. Over a million new product reviews are being added monthly, providing buyers with the information they need to make purchasing decisions. Additional search results, as your items will be surfaced when buyers narrow their search using the options found in the left-hand navigation panel of search results. All sellers should list using structured data—product identifiers and item specifics—every time they list. It is highly recommended that you provide as much structured data as possible, regardless of the item’s condition, so that your items can gain maximum visibility. NOTE: Use GTINs and MPNs whenever possible. Only use other product identifiers (such as ePIDs and ASINs) if you do not have access to the identifier from the product’s manufacturer, or in cases where the item is not branded. By February 2017, new listings of new or manufacturer refurbished items in most categories will require at least one of the product identifiers listed above. The option of using “NA” or “Does not apply” will no longer be acceptable as a product identifier. Some categories and item types will continue to be exempt. The list of exemptions will be communicated by next year. What categories require product identifiers? Click here for a complete list of categories that require product identifiers. Only new and manufacturer refurbished items will require product identifiers. Will this requirement be extended to additional categories in the future? Yes. As we continue to improve the buyer and seller experience, we will extend this requirement to additional categories. We will update the complete list of categories found here to reflect these changes. I sell in a category that doesn’t require product identifiers. Should I include them anyway? Yes. We recommend that you include item specifics and product identifiers whenever available, so that you can benefit from the additional buyer entry points we can create with the provided data. In categories where product identifiers aren’t required, providing data like item specifics will still enable us to boost visibility for your listings. For example, if a buyer does a search based on color, providing the item specific of color empowers us to surface your item within that search. I sell second hand and vintage items. Am I required to enter a product identifier when listing? No, only new and manufacturer refurbished items in most categories will require a product identifier to be added during listing. Product identifiers are not required in the category I sell but they are recommended. How do I know what information to input under item specifics? Product identifiers also include descriptors such as size and color. The more information you include in your listing, under the requested fields, the easier it will be for buyers to find your item. If a product identifier such as UPC is not available, we recommend you add other descriptors such as color and size. Can a listing have more than one product identifier? Yes, it’s possible for an item to have more than one product identifier. But use GTINs and MPNs whenever possible. Only use other product identifiers (such as ePIDs and ASINs) if you do not have access to the identifier from the product's manufacturer, or in cases where the item is not branded. I have a catalog of products I’d like to submit to eBay. How do I do that? This capability will be available by fall 2016 and, once it’s available, we will provide specific guidance on how to upload your catalog. How do I know what item specifics I should add to my listing? You will see recommendations for item specifics when you list using tools such as eBay Seller Hub, Selling Manager, Selling Manager Pro, File Exchange, and the single item selling flow. These flows make it easy to both see and add the recommended item specifics to your listings. Will other product identifiers, like those used by Alibaba, also be accepted by eBay? Not all types of identifiers will be accepted once these changes are in effect, but know that eBay accepts more types of identifiers than other marketplaces, and we’ll continue to expand the types of identifiers we accept. Will I still be able to list using the product identifier options “NA” or “Does not apply”? The product identifier options “NA” and “Does not apply” will be removed from the listing flow for most items (with a few exceptions). Later in 2017, existing Good 'Til Cancelled listings using these options will need to be revised to include at least one type of identifier. We will provide specific timing in the first quarter of 2017 and plan to give 90 days notice. What is a private label product identifier? A private label product identifier is an identifier created by sellers, specifically for products they manufacture or resell.